The Daily Grill – 1375 | The Daily Grill !!! 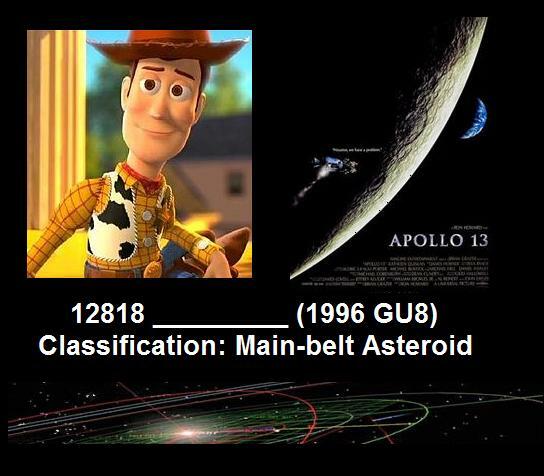 12818 Tomhanks (1996 GU8), an asteroid named after Hanks for his role as Jim Lovell in the movie Apollo 13. Connect : Tom Hanks. Explanation: Sheriff Woody(1ST PIC) is voiced by Tom Hanks in the films . Tom Hanks played role of Jim Lovell in the movie Apollo 13. 12818 Tomhanks (1996 GU8) is a main-belt asteroid discovered on April 13, 1996.